Being able to read informational texts effectively is a fundamental quality of successful readers. 4. One question they still have. 5. After teacher modeling, students read a magazine article independently and use the 3-2-1 strategy to comprehend what they read. ​This strategy can be used with text, video,field trip or as a review of new information. ​Analogies are an effective way to help students link new learning with a familiar concept. This strategy can be applied to any content area. To learn more about it, click on the link to view the Prezi . Also included is a template example and a blank template to create your own. annolighting_a_text.pdf​Use this strategy during and after reading to generate questions, analyze and interpret, or draw conclusions. CCSS require all students K-12 to learn what it means to close read. As you peruse the chart you will notice things you already do, but perhaps you will find something new to try. Concept Circles is a visual organizer divided into four sections. It can be used with informational text/videos for concepts, topics, and organizing ideas around vocabulary knowledge in all content areas.An Explanation and examples are provided to help you implement the strategy. The Double Entry Diary allows students to document ideas from texts and make connections while they are reading. A flowchart represents a process, it can be simple or complex. The sample below was created on Gliffy by Paul K! PowerPoint and Word also have flow chart layouts. The GIST Procedure is a strategy that can be used to improve students’ abilities to comprehend the gist or main ideas of a text. Headlines is as a reflection activity that identifies if students have an understanding of the main idea of the learning. 1. Students need to write a headline that explains the main idea. 2. Students justify in small groups their heading. 3. Headlines can be shared with the whole class and students can look for commonalities. ​Note: If you want to find out more ideas for using this strategy checkout out Making Thinking Visible by Ritchhart, Church, and Morrison. The book is available via district libraries. Do you have a conversation with yourself as you read? If not, you are not really reading. Our strategy of the week is Inner Voice. Use the template to connect to their inner voice. It can be modified to fit your needs. 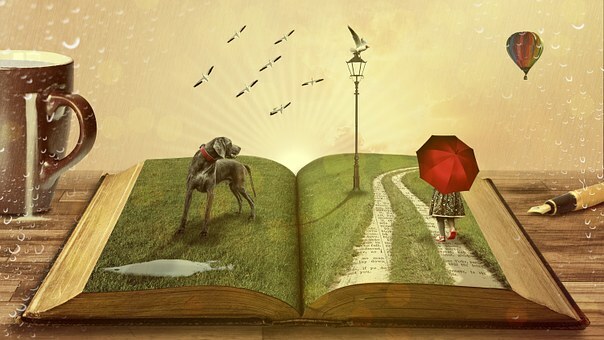 Introduce the strategy by using a short, familiar text, a fairy tale, for example. Provide students with a question/questions requiring inferential thinking. Model the use of the chart with students. Have students evaluate their reasoning processes. It is helpful to have students discuss their responses in small groups. Students use a highlighter to identify notable passages which they believe capture the essence of a story or article and must be able to justify these choices and discuss in small/whole group setting. Magnet summaries involve the identification of key terms or concepts from a reading, which students will use to organize important information into a summary. For example, Jen and Tom used this strategy in Citizenship when teaching the amendments. They gave the students the magnet word: Article 3. Students then read the article and wrote down the key terms or concepts in Article 3. Then students had to take these words and use them in a sentence. Lastly they had to organize these sentences into a summary that flowed, and used transition words. After reading, ask students "What is the most valuable idea that can be taken from this text?" Have students write it in a complete sentence. Have students find evidence from the text to support their answer and then think of examples in the real world to illustrate the idea. Included is a graphic organizer that can be adapted to fit your needs. This activity aligns with Reading Informational text Standard 1: Key Ideas and Details. Resource with directions, example and template. The Plus-Minus-Interesting (PMI) assessment activity prompts to students to evaluate a piece of text, art, music, video, scientific process, math approach, etc. The teacher chooses a topic and students describe the pluses and minuses of the concept or approach and note what makes it interesting. Template- this template can be edited online. Link to explanation and resources (with videos). This strategy is an extension of Pros, Cons, and Questions. Another column has been added to the left entitled perspectives. By adding perspectives to the pro, con, questions strategy, results in students taking their thinking to another level. Attached is a sample template, as well as a blank template for your use. Students critique the author's writing, engaging with the text for deeper meaning. RAFT is an acronym for Role, Audience,Format,Topic. This is a writing strategy that could be used to analyze something learned in a story, passage, video, article, etc. It can be used in most content areas. For example, students could assume the role of a colonist upset with the lack of self government. 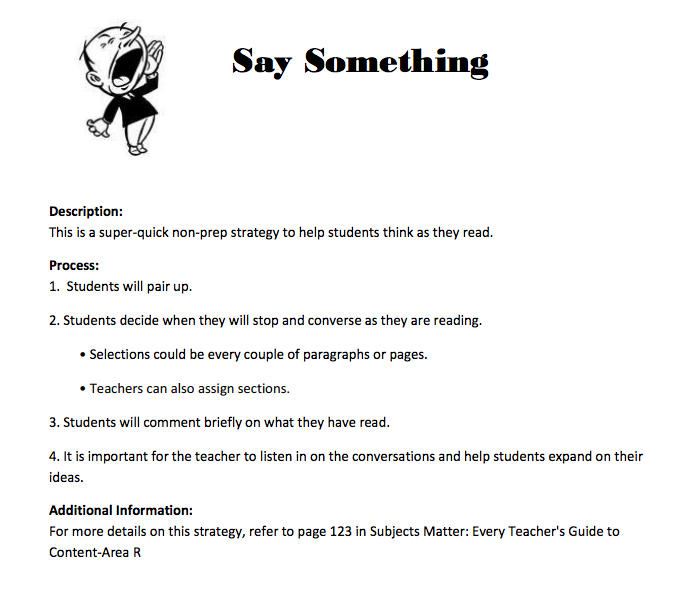 This is a super quick (no prep) reading strategy in which students converse as they read texts/articles in class. See-Think-Wonder (STW) is a strategy you can use to look closely at a painting, photo, artifact, graph, video, political cartoon, chart etc. It involves a 3 step process. Be cautious not to skip the SEE step and go directly to the think. In this first step it insures students look closely at the image which gives the foundation for steps Think and Wonder. 1. Teacher chooses the image. 2. See: Ask students what they notice? 3. Think: What are they thinking from their observations? 4. Wonder: What questions do they have now? 5. Share their thinking. Perhaps unanswered questions can be written down and posted for future discussions. If you want a more in-depth explanation of this strategy see Making Thinking Visible by Ritchart, Church, and Morrison. Available through district libraries. Silent Discussion or Exchange is easy to do and requires no prep. Students like this strategy and are eager to read the responses. The discussion at the end is usually successful. Detailed example lesson for Art. Do you have students who like to draw? Looking for a different way to access comprehension? Give "Sketch to Stretch" a try. The science example in the explanation can be modified to be relevant in any content area. The directions are quick, easy and no prep on your part. What is the Subject? the general topic, content, ideas contained in the text. What is the Occasion? the time and place of the piece, the situation that provoked the writer to write? Who is the Audience? the group of readers to whom the piece is directed. What is the Purpose? the reason behind the text. Who is the Speaker? the voice behind the text, what do you know about him/her from reading the text? ​The directions are simple and ideas are provided. In this strategy the teacher posts a question or prompt, and the students Think-it (think time to process the question / prompt), Ink-it (record their responses), and Link-it (connect their learning to their life or prior knowledge). It can be recorded in various ways: Blog, exit ticket etc. Want a new twist on the KWL? Here is updated strategy THINK-PUZZLE-EXPLORE (TPE). ​What do you think you know about the topic? This strategy can help teacher get a sense of students current understanding. (Pretest) New learning can begin to take place as students discuss. What puzzles (new questions) you about this topic? Encourage students to think about what puzzles they would like to further explore. After further exploration, students can share in small or large groups their findings. Note: If you want to find out more ideas on using this strategy checkout out Making Thinking Visible by Ritchhart, Church, and Morrison. Available through district libraries. Who doesn't occasionally show a video of some sort in their classroom? The strategy for today is: Viewing Comprehension Strategies: Watching Videos Like YouRead A Book. It includes multiple strategies to use with your students. Summarizing is an important skill. If students struggle to summarize, they are unable to think critically or analyze. This strategy can be used with text or video. The first column is for students to note what the text or video says. The second column has students focus on what is not said (left out) which will have students practice deep thinking. Often in articles, the author will choose a key line or quote to place in a box within the article. 1.Show your students examples of window quotes in articles or the newspaper. 2. Read an article and model a window quote for the main idea of an article. 3. Students read an article. 4. After reading the article, students write a window quote highlighting the main idea. Written Conversations can be used with fictional or informational texts. Written conversations are silent conversations that involve every student as a communicator through the entire process. The directions are clear and offer two variations.